The Adam Smith Review is a refereed multidisciplinary scholarly annual review, sponsored by the International Adam Smith Society, which provides a unique forum for vigorous debate and the highest standards of scholarship on all aspects of Adam Smith’s works, his place in history, and the significance of his writings for the modern world. The American Economist is a peer reviewed academic journal that publishes original research from all fields and schools of economic thought. The American Economist specifically encourages submissions from young scholars and those who are teaching the next generation of economists, and will continue to publish papers from experienced and prominent economists whose influence has shaped the discipline. The American Historical Review (AHR) is the official publication of the American Historical Association (AHA). The AHR has been the journal of record for the historical profession in the United States since 1895-one of the few journals in the world that brings together scholarship from every major field of historical study. The AHR is unparalleled in its efforts to choose articles that are new in content and interpretation and that make a significant contribution to historical knowledge. The journal also publishes approximately 1,000 book reviews per year, surveying and assessing the most important contemporary historical scholarship in the discipline. The Annals of the Fondazione Luigi Einaudi. An Interdisciplinary Journal of Economics, History and Political Science is a new, peer-reviewed academic journal aiming to promote interdisciplinarity as a method of scientific inquiry and a highly relevant issue in social sciences. The Annals, which publish two issues per year, aim at facilitating communication and encouraging cross-fertilization of ideas among both established international scholars and younger scholars working in the field of history, economics, political science, and other social disciplines. Its articles have rigorous style and language, but are accessible to scholars belonging to different fields of social sciences. The journal inherits but radically renovates the tradition of Annali della Fondazione Luigi Einaudi, founded in 1967. The Bulletin of Political Economy is a peer-reviewed journal welcoming contributions in all areas of economics. It actively seeks articles concerned with macroeconomic, monetary and microeconomic issues, international economics, development and structural change, history of economic thought and economic history. Articles that subject to empirical testing new theoretical developments or alternative theoretical approaches with the use of econometric and input-output techniques are particularly welcomed. The pioneering journal in its field, Business History Review, began publication in 1926 as the Bulletin of the Business Historical Society. BHR seeks to publish articles based on rigorous primary research that address major topics of debate, offer comparative perspectives, and broaden consideration of the subject. We are interested in the history of entrepreneurs, firms, and business systems, and in the subjects of innovation, globalization, and regulation. We also explore the relation of businesses to political regimes and to the environment. The Cahiers d’Economie Politique / Papers in Political Economy – PPE was created in 1974, and is now the main French journal specialized in history of economic thought. It has published and participated in the main theoretical discussions by paying a particular attention to the historical aspects of economic analysis. Considering that the study of past authors and contemporary debates are complementary, the PPE publish papers on history of economic thought, economic philosophy, or papers overlapping fields of history of economic thought and contemporary economic theory or economic history. Challenge is dedicated to publishing highly readable heterodox articles on contemporary and historical economic subjects. Its tradition is a progressive one, having been started in the 1970s to support new Keynesian ideas. Challenge’s readership is lay professional, but includes many economists and other academics who often use the articles as supplements to their class syllabi. It is a magazine, not a journal, and has thrived for more than four decades by serving as an approachable and timely source of ideas, information, and public policy proposals. It is written mostly by economists but also by political scientists, sociologists, psychologist, and journalists. Development and Change now appears six times a year, including the Development and Change Forum issue. Truly interdisciplinary in character, it includes contributions from all the social sciences and all intellectual persuasions concerned with development. With its history of publishing unconventional and challenging articles, the journal covers a broad range of topics in a mix of regular and special theme issues. Development and Change is devoted to the critical analysis and discussion of the complete spectrum of development issues. The Eastern Economic Journal, a quarterly publication of the Eastern Economic Association, was established in 1973. The EEJ is committed to free and open intellectual inquiry from diverse philosophical perspectives in all areas of theoretical and applied research related to economics. The electronic triannual Econ Journal Watch welcomes submissions of Comments on articles that appear in economics journals. EJW also welcomes essays, reflections, and investigations that speak to the nature and character of economics research and professional economists. Economia Politica publishes peer-reviewed articles that link theory and analysis in political economy, promoting a deeper understanding of economic realities and more effective courses of policy action. Established in 1984, the journal has kept pace with the times in disseminating high-quality and influential research aimed at establishing fruitful links between theories, approaches and institutions. The Economic History Review is an invaluable source of information and is available free to members of the Economic History Society. Publishing reviews of books, periodicals and information technology, the Review will keep anyone interested in economic and social history abreast of current developments in the subject. It aims at broad coverage of themes of economic and social change, including the intellectual, political and cultural implications of these changes. The Economic Journal is among the foremost of the learned journals in economics, and is invaluable to anyone with an active interest in economic issues. It is a key source for professional economists in higher education, business, government service and the financial sector, and represents unbeatable value for those who want to keep abreast in current thinking in economics. The journal reflects the current state and development of the economic theory and practice in Bulgaria and in other countries worldwide. It introduces results of research studies of Bulgarian and foreign scholars, as well as alternative views of specialists on discussed scientific and practical topics. Economic Thought, the online-based journal of the World Economics Association, accepts article submissions from scholars working in the history of economic thought, economic history, methodology of economics and philosophy of economics. Economics and Philosophy seeks to promote the mutual enrichment of the two disciplines by publishing high-quality original research in all contemporary areas linking them, as well as relevant book reviews. Economics and Philosophy only publishes articles that engage with issues that are of interest to both economists and philosophers. La revue a été fondée en 1946 par François Perroux pour contribuer au développement d’une “économie d’intention scientifique”. Son souci était de créer une revue théorique en lien étroit avec la pratique économique, tout en répondant à deux préoccupations: faire vivre le pluralisme et soutenir le développement d’une théorie de la dynamique socio-économique. Economie et sociétés a acquis, grâce à ses fonctions scientifiques et pédagogiques, une large audience internationale. Son souci constant de rénovation des concepts se traduit tantôt dans des cahiers où l’on trouve une analyse critique des faits économiques, tantôt dans des numéros à dominante théorique. La revue est subdivisée en plusieurs séries, qui couvrent divers champs thématiques de la recherche économique. Economy and Society plays a key role in promoting new debates and currents of social thought. For over 40 years, the journal has explored the social sciences in the broadest interdisciplinary sense, in innovative articles from some of the world’s leading sociologists and anthropologists, political scientists, legal theorists, philosophers, economists and other renowned scholars. In regular issues, and through issues devoted to special themes, Economy and Society covers questions ranging from economic governance to developments in the life sciences and beyond, and publishes major new work on current issues confronting progressive politics throughout Europe and the Americas, Africa, Australasia and the Pacific Rim. The Erasmus Journal for Philosophy and Economics (EJPE) is a peer-reviewed bi-annual academic journal supported by the Erasmus Institute for Philosophy and Economics at the Philosophy Faculty of Erasmus University Rotterdam. EJPE publishes research on the methodology, history, ethics, and interdisciplinary relations of economics, and welcomes contributions from all scholars with an interest in any of its research domains. EJPE is an Open Access Journal: all the content is permanently available online without subscription or payment. Every article has a unique and permanent URL. The European Journal of Development Research is a multi-disciplinary journal that seeks to broaden our understanding of the processes that advance or impede human development, whether from a political, economic, sociological or anthropological perspective. The domain of the EJESS is not restricted to modelling or methodological approaches of dynamic evolving process in economic and social systems. The authors have to identify the main real changes and suggest the critical parameters from empirical studies. They must highlight the directions and the importance of current changes. They would study the processes of innovation, the nature and role of new technologies, social dilemma in an evolving society, the mechanisms of change, and the management of private and public organizations in a rapidly changing context. In short, EJESS must pay attention to the new economy, from a critical as well as from a positive point of view. The aim of the European Journal of Political Economy is to disseminate original theoretical and empirical research on economic phenomena within a scope that encompasses collective decision making, political behavior, and the role of institutions. Contributions are invited from the international community of researchers. The European Journal of the History of Economic Thought (EJHET), a peer-reviewed journal, has quickly established itself as a leading forum for lively discussion on a wide range of issues in the history of economic thought. With contributions from both established international scholars and younger academics, EJHET is entirely pluralist and non-partisan with regard to subjects and methodologies – it does not subscribe to any particular current of thought, nor relate to any one geographic zone. The European Review of Economic History is a major outlet for research in economic history. Articles cover the whole range of economic history — papers on European, non-European, comparative and world economic history are all welcome. Contributions shed new light on existing debates, raise new or previously neglected topics, and provide fresh perspectives from comparative research. The Review includes full-length articles, shorter articles, notes and comments, debates, survey articles, and review articles. It also publishes notes and announcements from the European Historical Economics Society. Established in 1994, Financial History Review has earned a solid international reputation as an academic journal committed to research of high scholarly standards. The Review deliberately seeks to embrace a broad approach to financial, banking and monetary history, which appeals to a wide audience of historians, economists and practitioners. We welcome different perspectives including analytical narratives, theoretically-inspired research, advanced empirical analysis, and the interrelations between history, finance, policy, culture and society. Games and Economic Behavior facilitates cross-fertilization between theories and applications of game theoretic reasoning. It consistently attracts the best quality and most creative papers in interdisciplinary studies within the social, biological, and mathematical sciences. Most readers recognize it as the leading journal in game theory. History of Economic Ideas is a new international series of Quaderni di storia dell’economia politica. History of Economic Ideas rejects the dichotomy between “analysis” and “culture”: both aspects are of equal importance for a wider understanding of the subject. In a period such as our own, where paradigms which once seemed unshakeable are now being challenged, a multidisciplinary analysis of the historical development of economics might contribute to shedding light on the issues at the root of current debate. Besides essays and critical surveys, the journal includes archive material and reviews of new books on history of economics. History of Economic Thought and Policy accepts original papers across the full spectrum of scientific approaches within the history of economic thought. However, HETP has a special interest in analyzing the relationship between economic theories and public policy in different historical phases and national contexts. It is interested in exploring the role played by economists in advising and implementing policy measures and in taking active part in the life of major institutions, both economic or non-economic. It is also open to the publication of archival sources of major importance regarding the role of economists in policy decisions or debates. The History of Economics Review (formerly the HETSA Bulletin) is published by the History of Economic Thought Society of Australia. It is normally published twice yearly, in Winter and in Summer. Irregular issues may also be published. Focusing on the history of economic thought and analysis, History of Political Economy has made significant contributions to the field and remains an important means of communication. In addition to book reviews, each issue contains the products of original research on the development of economic thought, the historical background behind major figures in the history of economics, the interpretation of economic theories, and the methodologies available to historians of economic theory. The Iberian Journal for the History of Economic Thought (IJHET) is an international digital journal that is published every six months, for discussion and debate on original research dealing with economic thinking and the history of economic ideas that is promoted by the Iberian Association of the History of Economic Thought (AIHPE). After Quaderni di storia dell’economia politica, now in a new series as History of Economic Ideas, a group of experts who are particularly interested in analysing the characteristics and development of economics in Italy have launched a new journal: Il pensiero economico italiano. This journal is aimed at creating a meeting point of debate between historians and economists who wish to further their studies on the Italian tradition of economic thought, and on a broader spectrum, on the relationship between the history of ideas and analysis, and the history of economic events in Italy. The Independent Review is an interdisciplinary journal devoted to the study of political economy and the critical analysis of government policy. The Independent Review is thoroughly researched, peer-reviewed, and based on scholarship of the highest caliber. Ranging across the fields of economics, political science, law, history, philosophy, and sociology, The Independent Review challenges the politicization and bureaucratization of our world, featuring in-depth examinations of past, present, and future policy issues by some of the world’s leading scholars and experts. The Indian Economic Journal is the main Journal of the Indian Economic Association. It is published quarterly and it is a fully refereed Journal. Its main objective is to provide a forum for dissemination of the research findings of scholars from all over the world, on Issues of analytical, methodological and practical value to the professional community. The International Journal of Applied Economics (IJAE) is an online journal sponsored by the Institute of International Economic Studies. The purpose of the journal is to enhance the study of economic issues such as monetary policy, fiscal policy, exchange rates, international economics, economic growth and development, transition economies, health economics, economic integration, labor economics and relations, regional and urban economics, industrial organization, applied microeconomics, energy economics, public policy, economic programs, and other timely and concerned subjects. The International Journal of Political Economy is an international peer reviewed journal that publishes scholarly research in all traditions of political economy. Founded in 1971, it has evolved from being originally a translation journal that strove to make available scholarly work from former socialist countries to one that now seeks to build bridges among various schools of political economy that stand in opposition to mainstream neoclassical economics. The journal welcomes individual contributions from a critical perspective, as well as suggestions for special thematic issues in all fields of political economy internationally. The International Journal of Social Economics (IJSE) provides its readers with a unique forum for the exchange and sharing of information in social economics. The focus of the journal is the impact of economic activity on individuals in community, and its wider social meanings and consequences. The IJSE exists to explore the nature and ethical implications of social-economic problems, as these are analysed by geographers, historians, philosophers, political economists, political scientists, social and political theorists, sociologists, and theologians interested in social problems, as well as business academics. The International Review of Economics (IREC) is an international journal based at the University of Milano-Bicocca, Italy. It provides an international forum for academics and practitioners, covering a broad range of macro- and microeconomic subjects. Its main focus as a peer-reviewed scholarly journal is on hosting high-quality empirical, theoretical and policy-oriented contributions with an emphasis on rationality and reciprocity issues, including applications to such fields as welfare and happiness, capabilities, formal and informal institutions, the economics of law, economic dynamics, development, the history of economic thought, civil economy, and experimental issues. The Journal des Economistes et des Etudes Humaines (JEEH) is a journal of political economy and interdisciplinary economic studies. It addresses economic issues in political theory, social dynamics, social science methodology, and philosophy. Today, JEEH has an international audience, and welcomes contributions written by scholars from around the world. The Journal of Economic Behavior and Organization is devoted to theoretical and empirical research concerning economic decision, organization and behavior and to economic change in all its aspects. Its specific purposes are to foster an improved understanding of how human cognitive, computational and informational characteristics influence the working of economic organizations and market economies and how an economy’s structural features lead to various types of micro and macro behavior, to changing patterns of development and to institutional evolution. The Journal of Economic Issues serves as the primary international publishing outlet for scholarly articles with foundations in original institutional economics. Papers that apply institutional analysis to current and ongoing economic issues of social provisioning processes are welcome. The potential spectrum of topics is broad including public policy, economic development, environmental and ecological issues, education policy, economic stabilization, labor relations, monetary management, and other topics. Papers that advance institutional theory and methodology are also welcome and interdisciplinary work is encouraged. The Journal of Economic Methodology is a peer-reviewed research journal in economic methodology and philosophy of economics as well as cognate areas of inquiry related to these fields. 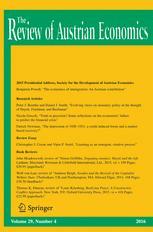 The Journal distinguishes between methodology (which concerns the relationship between economics and broad questions about scientific knowledge) and methods (which involve particular techniques relevant to practitioners in a specific field of economics) and reserves the pages of the Journal for authors and readers with broader epistemic interests. The Journal of Economic Perspectives (JEP) attempts to fill a gap between the general interest press and most other academic economics journals. The journal aims to publish articles that will serve several goals: to synthesize and integrate lessons learned from active lines of economic research; to provide economic analysis of public policy issues; to encourage cross-fertilization of ideas among the fields of thinking; to offer readers an accessible source for state-of-the-art economic thinking; to suggest directions for future research; to provide insights and readings for classroom use; and to address issues relating to the economics profession. The Journal of Economic Studies (JES) provides economists with research findings and commentary on international developments in economics. The journal maintains a sound balance between economic theory and application at both the micro and the macro levels. JES publishes research findings and commentary on international developments in economics. Articles on economic issues between individual nations, emerging and evolving trading blocs are particularly welcomed. Contributors are encouraged to spell out the practical implications of their work for economists in government and industry. As economics becomes increasingly specialized, communication amongst economists becomes even more important. The Journal of Economic Surveys seeks to improve the communication of new ideas. It provides a means by which economists can keep abreast of recent developments beyond their immediate specialization. Areas covered include: economics, econometrics, economic history and business economics. The Journal of Evolutionary Economics serves as an international forum for this new approach to economics. Following the tradition of Joseph A. Schumpeter, it focuses on original research with an evolutionary view of the economy. Articles feature a strong emphasis on dynamics, changing structures, and disequilibrium processes with an evolutionary perspective. The journal also stresses interdisciplinary analysis and theoretical, methodological, and applied work. As one of the oldest journals in the field of political economy, the Journal of Institutional and Theoretical Economics (JITE) deals traditionally with the problems of economics, social policy, and their legal framework. The Journal of Institutional Economics is an interdisciplinary journal that is of interest to all academics working in the social sciences, particularly in economics and business studies. Contributions from politics, geography, anthropology, sociology and philosophy are also be welcomed. The Journal of Institutional Economics aims to provide all authors with an expert verdict on their articles within fifty days of submission. The Journal of Markets & Morality is a peer-reviewed academic journal published twice a year–in the Spring and Fall promoting intellectual exploration of the relationship between economics and morality from both social science and theological perspectives. The Journal of Philosophical Economics is an inter-disciplinary journal that publishes high quality and theoretically innovative articles. The journal is committed to deepening the theoretical understanding of conceptual, methodological and substantive debates on economics and its social ramifications. The journal eschews monolithic perspectives and seeks innovative work that is intellectually pluralist. The Editorial Board takes a liberal stance in leaving a fair chance for contributors to provide the readers with a systematic, honest, and thoroughly researched account of an idea deemed fundamental for the advancement of the method of economic inquiry. The Journal of Post Keynesian Economics is a scholarly journal of innovative theoretical and empirical work that sheds fresh light on contemporary economic problems. It is committed to the principle that cumulative development of economic theory is only possible when the theory is continuously subjected to scrutiny in terms of its ability both to explain the real world and to provide a reliable guide to public policy. The Journal of Private Enterprise is a quarterly double blind peer reviewed academic journal published by The Association of Private Enterprise Education. The Journal of Private Enterprise brings together scholars in such fields as economics, management, entrepreneurship, marketing, finance, ethics, religion, and education who have done research on topics pertaining to systems of private enterprise worldwide. Published for The Society for the Psychological Study of Social Issues (SPSSI), the Journal of Social Issues (JSI) brings behavioral and social science theory, empirical evidence, and practice to bear on human and social problems. Each issue of the journal focuses on a single topic – recent issues, for example, have addressed poverty, housing and health; privacy as a social and psychological concern; youth and violence; and the impact of social class on education. The Journal of Development Studies was the first and is one of the best known international journals in the area of development studies. Since its foundation in 1964, it has published many seminal articles on development and opened up new areas of debate. Priority is given to papers which are: relevant to important current research in development policy, theory and analysis; make a novel and significant contribution to the field; provide critical tests, based on empirical work, of alternative theories, perspectives or schools of thought. The mission of Journal of the History of Economic Thought is to further the objectives of the History of Economics Society. These are to promote interest in and inquiry into the history of economics and related parts of intellectual history, facilitate communication and discourse among scholars working in the field of the history of economics, and disseminate knowledge about the history of economics. Metroeconomica is a journal of analytical economics: providing an international forum for debate among competing theories and research programs, addressing the role of social institutions, technical change and income distribution, emphasizing the behavioural foundations of economics, exploring methodological innovations in economics and from other disciplines. Moneta e Credito è una rivista scientifica online basata sul criterio della peer-review, che si propone di costituire un luogo di dialogo e dibattito sui temi dell’economia e della politica economica. La rivista pubblica interventi originali e incoraggia prospettive critiche e scambio di idee, cercando di abbattere muri di incomunicabilità culturale, ideologica e perfino teorica, nel tentativo di comprendere la complessità delle società moderne. Moneta e Credito pubblica articoli originali in tutti i campi e da tutte le scuole dell’economia politica, senza discriminazioni, purché siano rigorosi nel metodo e rilevanti nel merito. Gli articoli pubblicati sono normalmente di interesse per tutti gli economisti e gli operatori economici, e di rilevanza internazionale, sebbene con un’attenzione specifica sull’Italia. New Political Economy aims to create a forum for work which combines the breadth of vision which characterised the classical political economy of the nineteenth century with the analytical advances of twentieth century social science. It seeks to represent the terrain of political economy scholarship across different disciplines, emphasising original and innovative work which explores new approaches and methodologies, and addresses core debates and issues of historical and contemporary relevance. These include: Domestic, comparative and global political economy; Space, resources and environment; Justice, inequality and development; Global markets, institutions and regulation. Œconomia ­has a broad coverage, publishing articles in history of economic thought, economic methodology and economic philosophy, but also in normative economics and economic history in relation to history of economic thought. Leading specialists also contribute to a rich and regular book review section freely accessible on the journal website. PSL Quarterly Review is a peer-reviewed journal that provides an open forum for dialogue and debate on economics and economic policy, along the lines of its predecessor, the Banca Nazionale del Lavoro Quarterly Review (or BNL Quarterly Review). It welcomes original perspectives and diverse voices, encouraging a critical exchange of ideas. Public Choice studies the intersection between economics and political science. The journal plays a central role in fostering exchange between economists and political scientists, enabling both communities to explain and learn from each other’s perspectives. This journal’s roots are in the application of economic methods to problems normally dealt with by political scientists. While it retains strong traces of economic methodology, currently it also addresses newly developed, effective techniques that are not within the domain of economists. Research in Political Economy (RPE) analyses society in a manner consistent with the importance of the role of class. International in scope, the annual volumes deal primarily with economic and political issues and the unity between them. The series presents definitive volumes that bring together significant, international, and rigorous scholarship where both theoretical and empirical works are included. Research in the History of Economic Thought and Methodology (RHETM) is a journal / book series dedicated to an interdisciplinary approach to a broad range of topics related to the history and methodology of economics. The Review of International Political Economy (RIPE) has successfully established itself as a leading international journal dedicated to the systematic exploration of the international political economy from a plurality of perspectives. The journal encourages a global and interdisciplinary approach across issues and fields of inquiry. It seeks to act as a point of convergence for political economists, international relations scholars, geographers, and sociologists, and is committed to the publication of work that explores such issues as international trade and finance, production and consumption, and global governance and regulation, in conjunction with issues of culture, identity, gender, and ecology. The Review of Keynesian Economics (ROKE) is dedicated to the promotion of research in Keynesian economics. Not only does that include Keynesian ideas about macroeconomic theory and policy, it also extends to microeconomic and meso-economic analysis and relevant empirical and historical research. The journal provides a forum for developing and disseminating Keynesian ideas, and intends to encourage critical exchange with other macroeconomic paradigms. The Review of Political Economy is a peer-reviewed journal welcoming constructive and critical contributions in all areas of political economy, including the Austrian, Behavioral Economics, Feminist Economics, Institutionalist, Marxian, Post Keynesian, and Sraffian traditions. The Review publishes both theoretical and empirical research, and is also open to submissions in methodology, economic history and the history of economic thought that cast light on issues of contemporary relevance in political economy. Comments on articles published in the Review are encouraged. Peer-reviewed and published quarterly, the Review of Radical Political Economics (RRPE) has been a leading outlet for innovative research in non-orthodox economics for more than forty years. RRPE promotes critical inquiry into all areas of economic, social, and political reality with articles covering all areas of political economy including, but not confined to, Marxian economics, post-Keynesian economics, Sraffian economics, feminist economics, and radical institutional economics. For over seventy years, the Review of Social Economy has published high-quality peer-reviewed work on the many relationships between social values and economics. The field of social economics discusses how the economy and social justice relate, and what this implies for economic theory and policy. Papers published range from conceptual work on aligning economic institutions and policies with given ethical principles, to theoretical representations of individual behaviour that allow for both self-interested and ‘pro-social’ motives, and to original empirical work on persistent social issues such as poverty, inequality, and discrimination. This journal intends to contribute to the structure of the field of economic philosophy by supporting the development and distribution of fundamental and applied research in the field and to consolidate its recognition within the scientific division of labor. La Revue d’Economie Politique publie des articles scientifiques dans tous les domaines de l’analyse économique, en français ou en anglais. Outre les articles de recherche qui constituent l’essentiel de ses numéros, la Revue publie des Bilans et Essais, présentant une synthèse des développements récents de l’analyse économique dans un domaine particulier ainsi que des articles courts, qui s’inscrivent dans une section Débats et Opinions et défendent un point de vue personnel sur un problème de politique économique. La Revue économique a été créée en 1950 par un groupe d’universitaires de l’École des Hautes Études, des Facultés de Droit et des Lettres de Paris et du Collège de France. Depuis sa création, elle publie des travaux originaux dans tous les domaines de la recherche économique théorique et empirique. Toujours ouverte aux apports des autres sciences sociales susceptibles d’enrichir la réflexion et les méthodes des économistes, c’est une revue généraliste qui souhaite offrir une vision aussi large que possible à toutes les tendances de l’analyse économique. La Revue Française de Socio-Economie is a new, multi-disciplinary journal. It seeks to publish articles that contribute to a better understanding of actual economic practices. The journal aims to provide a forum for debating the essential characteristics of socio-economics and is determined to be open to all the various empirical approaches adopted in the social sciences. Fondata da Luigi Einaudi nel 1936 e pubblicata dal Mulino dal 1997, la Rivista di Storia Economica si rivolge non solo agli storici economici, ma anche agli economisti, ispirandosi alla straordinaria modernità del metodo einaudiano. La rivista si occupa di storia economica italiana, europea ed extraeuropea, nella convinzione che l’affievolirsi dei legami tra economia e storia possa produrre un impoverimento di entrambe le discipline. Analizza le vicende e le istituzioni delle economie dall’età antica a oggi e studia le principali politiche economiche dell’età contemporanea, nella prospettiva del loro sviluppo storico. La Rivista economica del Mezzogiorno analizza la realtà meridionale e i processi in atto nel contesto nazionale e internazionale in cui il Mezzogiorno è inserito; approfondisce la questione meridionale che si pone oggi in termini più che mai difficili, sia per la necessità di una politica regionale più efficiente ed efficace, sia per i vincoli all’accrescimento della capacità competitiva del sistema produttivo del Mezzogiorno. La rivista offre il suo contributo al dibattito in corso nelle sedi politiche e negli ambienti economici sugli obiettivi e gli strumenti più adatti a garantire efficacia e correttezza alla necessaria azione pubblica di intervento nel Mezzogiorno. The journal publishes articles and reviews in the fields of economic, business and social history with a particular, but not exclusive interest in Scandinavia. The journal also publishes contributions from closely related fields and articles dealing with theoretical and methodological issues. The Scandinavian Journal of Economics is a general-interest journal that publishes high-quality and innovative research in all disciplines of economics. Science and Society is a peer-reviewed interdisciplinary journal of Marxist scholarship. It publishes original studies in political economy and the economic analysis of contemporary societies: social and political theory; philosophy and methodology of the natural and social sciences; history, labor, ethnic and women’s studies; aesthetics, literature and the arts. We especially welcome theoretical and applied research that both breaks new ground in a specific discipline, and is intelligible and useful to non-specialists. The Scottish Journal of Political Economy is a generalist journal with an explicitly international reach in both readership and authorship. It is dedicated to publishing the highest quality research in any field of economics, without prejudice to the methodology or to the analytical techniques used. The editors encourage submissions in all fields of economics in order to provide practical contributions to the literature, and to further the influence of economics in the world of practical affairs. Gli studi economici italiani appaiono oggi singolarmente fiorenti. Da un lato il relativo declino che aveva caratterizzato le ricerche economiche nel periodo fra le due guerre mondiali è pienamente superato; dall’altro è in via di rapido superamento anche l’impostazione della ricerca che appare dominante negli anni immediatamente successivi alla seconda guerra mondiale e che vide gli studiosi italiani ricalcare metodi di ricerca e temi di studio propri delle scuole anglosassoni più affermate. In questa direzione Studi economici assolve una funzione propulsiva, non solo ospitando contributi di studiosi italiani e stranieri ma anche svolgendo una funzione di promozione, individuando di volta in volta i temi di riflessione più rilevanti, stimolando studiosi di valore a farne oggetto di indagine.